Here we are. It’s time for the third and last part of the Pear Trilogy. After the Pear Espresso Trifles, I totally fall in love with that flavor combination and I decided to try it out again. I think unconsciously I felt attracted to this combo of ingredients a long time ago before because I remember seeing a Pear Espresso Panna Cotta recipe on an old Donna Hay Magazine (for sure a couple of years old!) at a friend’s house and writing it down….for the future. I’m so happy I wrote down this recipe. I’m so so so happy I finally decided to try it! I don’t know if I have the right words to explain how amazing this dessert is. The pear espresso flavors are combined in such a perfect proportion! It truly is a grown ups desserts but still so playful. I think the syrup needed to be a bit more dense than what I obtained but at the same time I’m glad it turned out that way because we had a lot of pear-espresso syrup to dip the panna cotta in. If you are not attracted by the pear espresso combination, don’t just leave! This is by far the best home-made panna cotta I’ve ever had so I’m sure I’ll make it again with other flavors and twists! Just suffice to say (as I tweeted that day) that I barely had time to take pictures. Wally, surely not the kind of person who goes nuts for these types of desserts, ate one of this in the first 5 mintues they were unmolded. 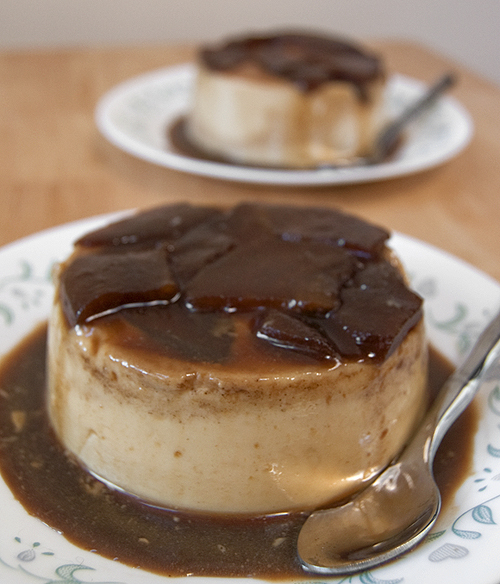 One final note: when I made them, I felt there was way too much panna cotta compared to pear espresso syrup. I completely filled up my two big ramekins and thought “next time, I will split the panna cotta mixture into 3 or 4 smaller ramekins”. Well, after I tried it, I thought it was perfect to have so much panna cotta compared to pears and syrup, otherwise the espresso flavor would have been overwhelming. Final final note: this recipe is ridiculously simple! So what are you waiting for? Go ahead and try this recipe. Place the coffee and the sugar in a small saucepan over low heat and stir to dissolve the sugar. Please, please, please: use good espresso not drip coffee! Add the pear slices and cook for 10-15 minutes or until tender and the syrup has thickened slightly. Place the pears on the base of 2 lightly greased ramekins. Pour the syrup evenly over them and allow to cool at room temperature. Put the gelatine and the 2 tbsp of milk in a small bowl. Stir to combine and let stand for 2-3 minutes, until the gelatine has dissolved. Place the cream, the extra milk, the brown sugar and the vanilla extract in a pot over medium heat and bring to boil. Remove from the heat, add the gelatine and whisk to combine. Set aside to cool. Slowly pour the cream mixture over the pears and syrup. Refrigerate for 4-6 hours over overnight. If you have a hard time unmolding the panna cotta from the ramekins, run the bottom and side of the ramekins under hot water for a couple of minutes. I still had to shake them pretty hard but they eventually unmolded without breaking. There's your lovely panna cotta! This is a definite must-try. I love all that syrup and those pear pieces. I also ended up with larger portions on mine because my ramekins were a bit bigger but like you, I think it wasn't so bad. I'll use this recipe next time. Looks delicious, Sara! I think a pear espresso combo sounds AMAZING! These are gorgeous. I'll have to give the pear/espesso flavor combo a try sometime, I just got some new ramekins! Simply gorgeous! 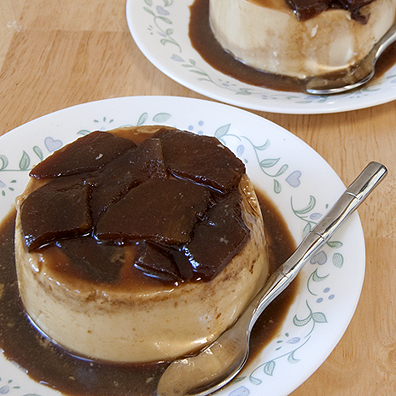 I love that these are part panna cotta, part flan, part upside down cake... not to mention that the flavour combination sounds irresistible. Will have to try these next time I'm in the mood for a simple but spectacular dessert. That panna cotta looks absolutely gorgeous! The richness of the espresso syrup sounds like it goes so beautifully with the pears and panna cotta. I never would've thought of that combination! Great idea! I am in love with this flavour combo and I haven't even tried it. I just love the IDEA of it. It's beautiful and the syrup looks dense enough to me. I have never made panna cotta, I have to try it! Pears and espresso sounds like such an amazing combination of flavors, I could see how it could be a little overpowering, I think the bigger panna cotta was a good idea. I can't wait to see what your next trilogy is! So pretty. I was surprised the recipe was so easy. Oh they are beautiful! This flavor combination sounds very appealing...I'd love to give that a try! Wow, that looks so good. I would have never thought to combine those flavors, but I can see where it would work. From the sound of you, it works amazingly well! I love the final result. It's gorgeous. Another job well done, Sara. I'm all about simple recipes! And, every time I see pears I kick myself for always forgetting about them! I seriously need to make a grocery list with pears at the top! Holy Moses! Your photos made my heart bang in my chest! I love panna cotta, coffee AND pears and right now, I'm breaking out in a cold sweat!! I love Panna Cotta but never attempt to make it in my kitchen. It seemed so much work, reading yours I can't say it's a piece of cake making it but doesn't sound as hard as I imagined. I have to get myself together and give it a try. I've never made panna cotta before, but this one is calling my name. I do have ramekins, so all I need is pears, and luckily they are in season. thanks for sharing this wonderful flavor combo. 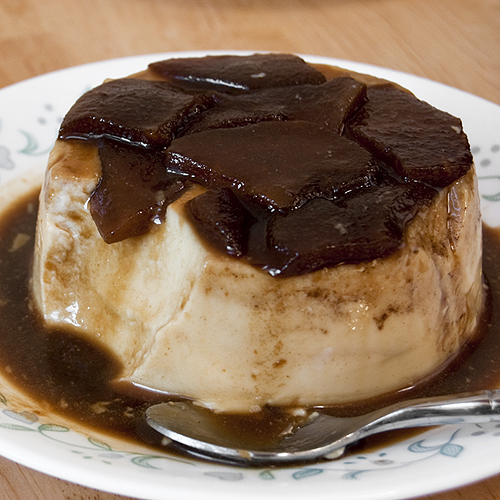 I've never actually tried panna cotta before, but every time I see one I think I should try it. It looks so yummy! MMMMMM!! !Che meraviglia!!!!!! !Mi lecco già i baffi!!!!! This pairing is quite delicious and decadent. It certainly is an elegenat way to marry these two flavours. Very grown up indeed. I like how the texture looks and the syrup under the panna cotta. Pears and espresso sounds like a warming flavor combination. Beautifully done and I'm inspired to give it a try. I am obsessed with panna cotta. I ordered with I go out to restaurants and I have yet to make it. This combination you created sounds amazing. I have archived your posting to make. Happy Sunday! I don't think you do have to express how good it is--the pictures make is perfectly clear! I can't get over the genius of pear and espresso! Delicioso - I'll eat panna cotta any time I get my hands on it! Love to make it too. Thanks for sharing such a delicious recipe. Your photos are quite stunning! Just...WOW! These look so amazing!!! I'm glad you guys liked this recipe. It was a hit in my home and among friends. And for those who have never made panna cotta before: don't be scared...it really is as easy as it sounds if you have a good recipe and follow it. When you gain confidence you can start playing around...which is what I will do next! Sara, I love the flavour combination and the cream part of the panna cotta looks so perfect.